I have three children. Three male children, to be exact, and I love it. Life is crazy at our house and it seems that the minute after I pick something up off of the floor, there is already something new to take its place. Can you say monster trucks? During the baby years for each of my children, I would occasionally call them “Little Man.” I’m not sure why it never translated to the toddler and preschool years–maybe it just feels more appropriate for a baby. 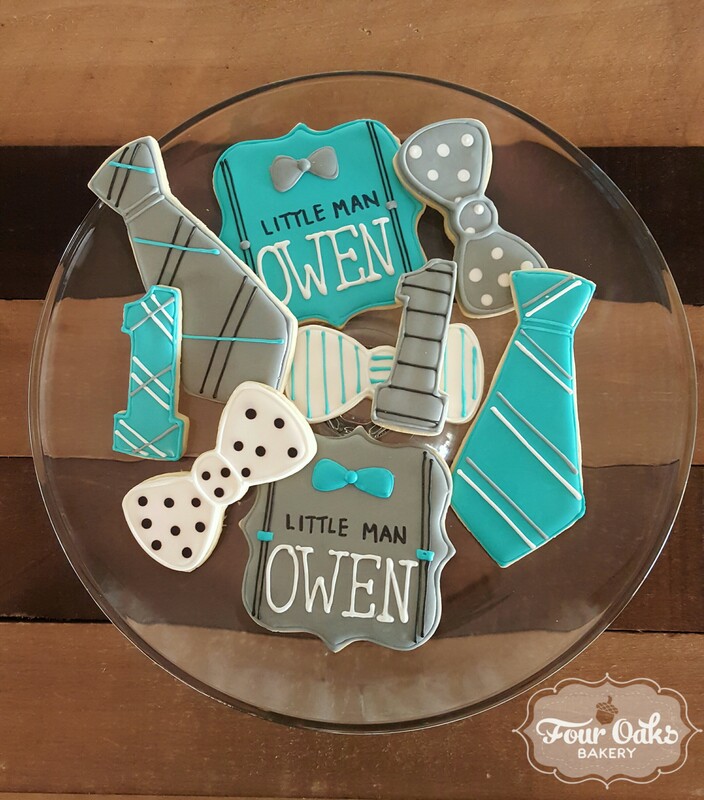 Therefore, when I was asked to make cookies and cake for a Little Man themed first birthday party, I was very excited. The neckties, the bowties, the moustaches, the suspenders– it’s just adorable! 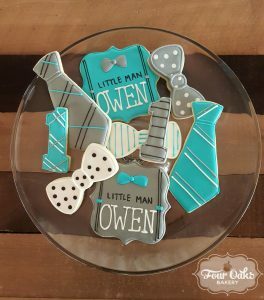 Mom and Dad chose a teal, gray, black, and white color scheme, so those colors were used across the three items. These cookies were all unique. No two were exactly the same! The cake was almond flavored with a truly swoon worthy raspberry buttercream filling. The outside is covered with vanilla buttercream and fondant accents in the gray, teal, and black party colors. The Little Man’s smash cake was a festive funfetti with vanilla buttercream and a fun piping design on the side. 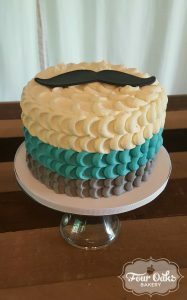 It was topped with a black fondant moustache to bring the whole theme together. 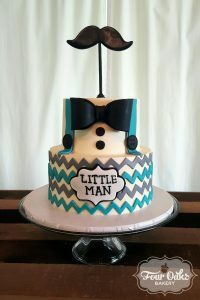 I was so happy to see pictures of the birthday boy in his buttercream covered glory and to know that this family had a fantastic time celebrating a special little boy’s first year of life!